Be sure to also check out Marcel Proust's account. If you can't get enough of odd images of my body, be sure to check out my brain page. This page relates my experiences with corrective eye surgery. 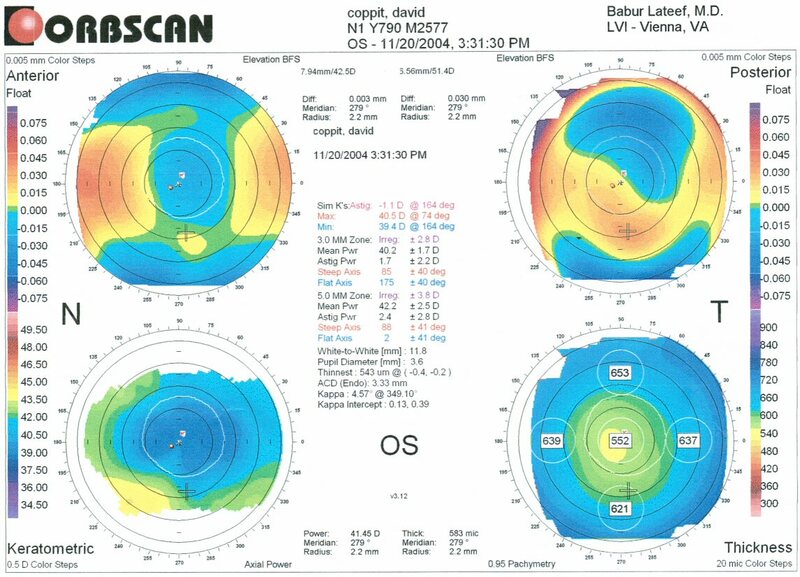 I first had both RK and Lasik in December 1995, and then had a "touchup" for the Lasik eye in November 2004. I describe both experiences below. RK cost me $625 for an eye (address below), and Lasik cost me about $2000 for an eye. I hear that RK varys from $500 to $2000 depending on the state. Before surgery right eye was worse than the left, at 20/400 (-6.00+1.25X090). The left eye was 20/300 (-4.75+1.25X090). I thought I would dispassionately talk about correcting nearsightedness, then relate the gory details for those who can take it. Keep in mind that although I've played the story up a bit, the surgery was definitely worth it. The whole thing was really finalized when I had my glasses turned into sunglasses. Update #1: I went back to the doctor six months after the surgery for a checkup and possible touch-up, and they said my vision was a little better than 20/20. Update #2: Occasionally my right eye is blurry (about 1 out of every 15 days). 11 months after the surgery I went to the eye doctor, who said that my right eye was a little weak, but nothing to worry too much about. Since my vision is fairly good now, I think I'll forgo more surgery. Update #3: As of this update (5/6/98), my eyesight is still pretty good, although my right eye is slightly blurry. It doesn't bother me much, so I'm satisfied. Update #4: (2/21/2001) Same as #3. Something like 90% of the eye's focusing is done in the cornea. If the cornea is too curved, the light rays do not focus on the retina, but rather in front of it, resulting in nearsightedness (see the left diagram). 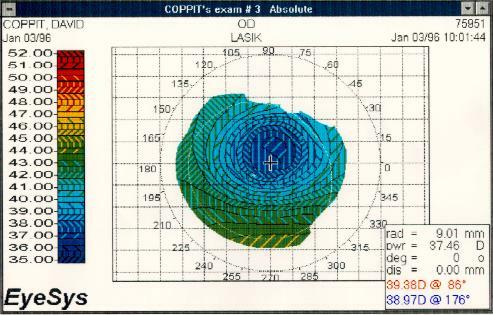 If the cornea is too flat, you'll have farsightedness (see the middle diagram), and if the curvature of the cornea is not consistent, you have the problem of astigmatism (see the right diagram). In all of the surgical procedures below, you are awake, but are pretty out of it as a result of the valium they give you. After the surgery you walk out, and for a while it feels like there's something in your eye, but there usually isn't pain. RK is only used for nearsighted patients, but I believe the other two can also correct farsightedness. 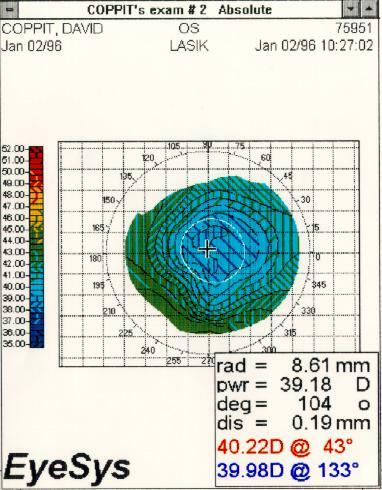 The eye clinic had a machine that could determine the eye's topology based on the reflection of a series of concentric circles off of my cornea. (A picture is available.) The left eye is above, and shows how my eye looked two weeks after RK. The right eye is on the right. The top picture is before surgery, and shows how my cornea had "dimples" which caused astigmatism. The after surgery picture shows how nicely curved the eye was one day after surgery. Usually the surgery takes less than ten minutes, and you end up leaving two hours after walking into the clinic. The cost is around $500, which includes any follow-up surgeries you might require for up to a year. The biggest side effect is "starbursts" that I see around lights at night. They extend along the radial cuts that were made. Photorefractive Keratectomy (PRK) Uses a laser to shape the cornea by burning off very thin layers of tissue. This procedure has a higher chance of correcting highly myopic patients than RK, and is thus preferred in those circumstances. One side effect is the amount of recovery involved (discomfort for about a week) as a result of the eye having to regrow its protective outer layer. Since a company called Summit manufactures the laser, they have the option of jacking up the price by $200 per eye, which makes PRK run about $1600. 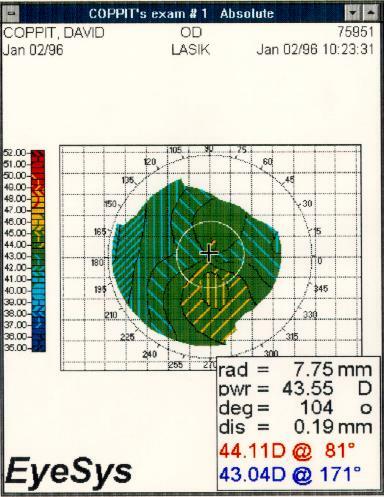 And since Summit makes many lasers for eye surgeons, their device has been evaluated and approved by the FDA. This procedure used a special laser that was built specifically for this procedure, and as a result didn't require FDA approval. It also meant that the surgery would only cost around $1300. One bad thing is that the procedure is more complicated and usually takes 45 minutes or so. It also takes longer to heal (3 weeks), but is much less uncomfortable than PRK and results in usable vision within three days. The starburst I see from my right eye is more diffuse and a little smaller than that of the left eye. One downside to this procedure is that the vision fluctuates quite a bit for the first month or two. I don't think I would have been able to drive had both eyes had this problem. In other words, RK provides very stable vision within a few days, but Lasik may take a couple of months to stabilize. On the other hand, I've had doctors tell me that if they were in a hurry, they wouldn't have noticed that I had any surgery done on the Lasik eye. I had RK done on my left eye. First they put a very flattering blue robe on me, along with shoe covers and a shower cap. Then they sat me in a wheelchair and took my blood pressure and temperature, then gave me eye drops and two valium. The guy next to me said that is was his fourth time having his eyes worked on. He had very bad eyesight, and I think they started on him when PRK wasn't yet well studied. A few minutes later they moved me to the couch, where I promptly fell asleep. Then they woke me up and laid me on a machine that checked my eye pressure (or maybe it measured the dimensions). They woke me up again to take the measurement and then moved me into the operating room. At this time there were more eye drops, and they put a clip on my eye to hold it open (which isn't all that bad since the eye drops and valium make it so that you don't want to blink). Then the doctor came in and made sure I was comfortable. I believe he made some marks on my cornea with some kind of pen. Then he told me to look straight at the light above me as he made the incisions. I could feel the scapel going in some, but it didn't hurt. It looked like the scapel was pulling my field of view to one side and to a point (it reminded me of one of those bendable mirrors when someone pokes it with a finger). Then he placed a ring with two arms on it over my eye and twisted it to make the T cut. He made one more cut with another ring, and I was done! I slept most of the afternoon and woke up in the evening to eat and talk to a few people on the phone (I only vaguely remember the conversations). Then I went back to sleep for the night. The next day it felt like there was something in my eye, but otherwise I was fine. My vision was much better than before, and improved to 20/20 over the course of the next few days. There were more drops, but they also put a stick with a medicated flat end under both of my eyelids to numb them. I told them that I didn't need them numbed before, and they said that they open the eye a little wider and wanted to make sure that my eyelids wouldn't be uncomfortable. Then they patched up my left eye and placed a piece of plastic with a sticky hole in it over my head. The hole was stuck to my eyelid in order to keep everything possible out of the area of the eye. Next they put the clip on me and lined me up with the laser. The doctor came over and checked everything out, and tried to make me feel more at ease. I felt pretty relaxed, but I didn't know what was coming up (hold on). First he told me to look straight ahead as he put something over my eye that looked like a metal detector (round part with a straight handle to the side). Then he pressed fairly hard on my eye as some suction was applied, which caused me to go temporarily blind. This was because the blood to the cornea was being cut off, much like the spots you see when you push hard on your eye. Of course, I was pretty worried about this, and made sure to tell the doctor in case something weird was going on. But the real disturbing part was when the thing came to life, buzzing around my eye and cutting the cornea. At this point I assume the doctor grabbed the flap with some forceps and pulled it to the side, because very shortly he asked me to look straight ahead while he applied the laser. There was a series of tapping noises that gradually became quieter, and these laser bursts were done for four passes. I think at this point they released the pressure on my eye, and I could see some blurs moving around. The doctor asked for irrigation, and flooded my eye with water, then came in with some sort of flat Q-tip to wipe away the residue of the laser's work. After that they let me air dry for a couple of minutes, then he replaced the flap of my outer cornea, and they let me air dry for a little longer. Finally they let me get up, and took me outside, where they put a shield on my eye to keep me from hurting it during the rest of the day and while sleeping. Two Tylenol later I was heading for the door. That night I could feel the edge where he slightly damaged the flap when he grabbed it with the forceps, but that went away by the next morning. Three days later I went back to the doctor who did my left eye, and he said that he couldn't tell that any surgery had been done at all. While he was walking out he mumbled to his assistant, "We're going to have to learn that one." 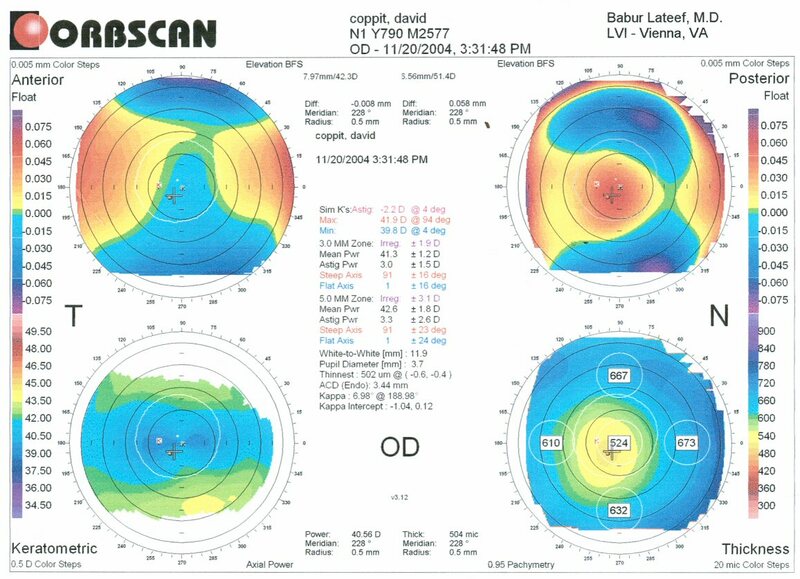 Nine years after my Lasik surgery, I was getting frustrated with the astigmatism in my right eye. I was enticed by a newspaper ad that said Lasik surgery could be had for $299. Two days later I met with the eye doctor, who checked the basic health of my eye, and gave me advice on which surgery to use. It turns out that the $299 price was for the cheaper laser that does not correct astigmatism more than 2.0 (of course). I'd be best served by the newer Bausch and Lomb laser. Luckily, with an educator discount and a travel discount, the overall price would only be $650, including the exam and followups with my local doctor. The following Saturday I was in the clinic for the surgery. Yes, that's right---I got the surgery within a week. This time the eye doctor (and the company rep previously) went out of their way to explain the steps of the procedure. The doctor was surprised that they left the pressure ring on my eye while they did the laser, since that kind of pressure isn't healthy for extended periods of time. He also said that I was the oldest touchup that he had done, most being at most 4 years old. Above is my left eye, which you can compare to the previous EyeSys map. As you can see, the machine is more sophisticated now and provides several graphs which are labeled in the corners. I believe that the posterior is the comparable graph to the one from last time. Above is the right eye. The doctor said that the red spot was the problem. This time the surgery was much more streamlined. Instead of the full robe I just got the hair net and shoe covers. Instead of medicated sticks and valium, all I got was some eye drops. As I walked into the laser room, the assistant was testing the laser by zapping a metal plate. Watching the sparks fly was a bit unnerving. As I got on the table, the doctor and assistants went into a very technical protocol-based speech, checking that I was who they thought I was, etc. This time the buzzing cutter was very fast--perhaps 2 or 3 times faster. And once the cutting was done, the doctor removed the ring so I could see again. For the zapping part, the doctor just had me look at a blinking led. The room smelled a bit like a bug frying on a halogen bulb (yuk!). He wiped the zapped area, irrigated, and replaced the flap. Afterwards, he took another look at my eye under the microscope and said that he was a bit unhappy with a wrinkle in the flap. So he took me back in for an adjustment and the placement of a contact lens to help flatten things out a bit. As I said, everything was very fast. The whole thing probably only took 45 minutes. The next day I stopped by my local optometrist to make sure that everything was okay. As of this writing, it's been a week, and my eyesight isn't perfect. I hope that it continues to improve, but I'm thinking I should have gotten their $100 "insurance" that provided touchup surgeries for up to a year after the initial surgery.